Stay slayin’ from head to toe with the sorta’ fake tan, body moisturiser and shower gel your beauty stash has been missing. Discover This Works, a skincare brand that aims to act as a remedy for the stresses of modern life and the detrimental impacts that it can have on the skin. Save 20% on selected St. Tropez PLUS receive a FREE Self Tan Purity Bronzing Water Face Mist when you spend £30 on the brand. Capture the Summer sun all the way from Australia with Bondi Sands. Our Beauty Editor has found the best perfumes and fragrances to make sure your scent game's on point all season long. It is not just the skin on our faces that we need to look after, it is essential that you also pay the rest of your skin the attention and pamper your body regularly. From relaxing bath and shower products, to tanning and body care, HQhair have all of the bath and body products that you could possibly need to ensure that your body is looking and feeling its best. A warm bath is beneficial for both your body and mind. A soak in the bath can improve blood circulation, increase your metabolism and calm your nervous system. One way to better your bathing routine is to prep your bath with a bath bomb or bubble bath. The Bubble T Bath Fizzer is a perfect option and is available in a range of different aromas, including hibiscus and acai berry tea, moroccan mint tea and lemon grass and green tea. This fun and quirky bath fizzer will protect, calm and comfort both your body and mind. Just like the skin on your face, your body also needs to be cleansed and clarified to properly remove any dirt or left over residue. The Yes To Carrots Nourishing Body Wash is 96% natural and completely parable-free. Formulated with organic carrots and a cocktail of vitamins, this effective body wash will leave your skin feeling clean, refined and naturally nourished. Again, like your facial skin, your body needs to experience exfoliation - ideally - twice a week to remove any dead skin cells from the skin's surface. The Mio Skincare Double Buff Dual Action Enzyme Exfoliator is a gentle, yet effective scrub that aims to scrub, buff and polish the body. Infused with organic sweet almond, shea and fig extract, Double Buff is ideal for perfecting skin within just 30 seconds! When it comes to hair removal, it is important to protect your body in the places that you will be removing the hair from. Shaving can sometimes irritate your legs, so instead choose the bliss 'Fuzz' Off Foam. This unique foam formula us ideal for removing unwanted hair, whilst nourishing your skin with marine extract and a double butter complex. Simply leave on for up to 5 minutes for silky smooth skin. Once you have removed any unwanted hair from your body, it is vital that you nourish your skin. The Elemis Skin Nourishing Bath And Shower Cream utilises a range of luxurious ingredients to enrich your body and balance your skin. Enriched with camellia, macadamia and jojoba oils, your skin will be left looking healthy and supple, whilst feeling silky and smooth. Similar to how you would moisturise your face, your body also requires regular hydration, especially in 'dry patches' like your elbows and knees. The bliss Vanilla And Bergamot Body Butter is ideal for locking in moisture after a bath or shower. Containing a blend of of amber, lemon and bergamot, with repeated use this gorgeous butter formula will leave your skin feeling silky and soft. We regularly use anti-ageing products on our faces, so there is no reason as to why we should not firm and tone our skin on the rest of body. The NUXE Fondant Firming Cream is enriched with a cocktail of natural ingredients to give your skin a more youthful appearance and combat any signs of sagging. This firming cream is ideal for problematic body areas, like thighs, stomach, chest and arms. This step is completely optional, but if you prefer to appear a little more bronzed than your natural skin tone, then you can include a fake tanning product into your bath and body routine. Use the St. Tropez Self Tan Bronzing Mousse for an ultra-even tan that diffuses a subtle, yet refreshing fragrance. This lightweight, velvet mousse is infused with conditioning aloe vera, nourishing your skin and ensuring that your tan is long lasting. They say that beauty starts from within and that is why incorporating vitamins or supplements into your daily routine can really benefit the health and welfare of your body. The myvitamins You Go Girl is unique blend of nutrients that are combined into one supplement to help you get on the go each day and achieve the body goals that you wish for. Sun care can usually be overlooked unless on holiday, however it is important to include SPF into your body routine daily. 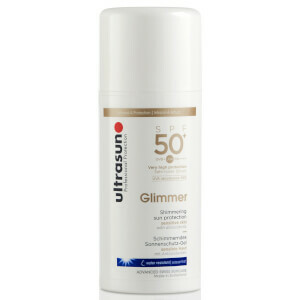 The Ultrasun Transparent Sun Protection Sports Gel SPF30 is a water-resistant sun cream that quickly glides onto the body, absorbing quickly without leaving behind any left over residue.